Infrared barbeques came from the manufacturing arena where similar devices were invented for applications needing intense and instant heat. Almost by accident, someone tried placing a ceramic infrared burner into a traditional gas grill and liked the results. Infrared grills were born. Infrared barbeques operate much like any other gas grill, except instead of operating traditional burners, the pressurized propane or natural gas is used to produce infrared radiation. Another difference is direct heating. The rectangular ceramic burners are the surface on which food is placed. Traditional grills use convection heat; they heat the air around the food thereby cooking the food itself. Infrared grills are much hotter than a traditional grill. A quick and delicious barbequed meal can be made easily, without constant attention. Quicker cooking times mean that even a quick lunch hour is plenty of time to fire up the grill, cook your lunch, and have plenty of time for a leisurely meal. Infrared grills use less fuel, saving you money. It needs less fuel to get to cooking temperature initially. When turned on, it can reach 1000 degrees in three minutes. You can cook your food, clean the grill and have it cool enough to cover up in the time it would take just to heat up a traditional gas grill with all burners on high. It continues to use less gas as it cooks food faster and doesn’t need to be on as long. Clean up is easier, too. The high temperatures practically vaporize any drippings or unwanted mess. 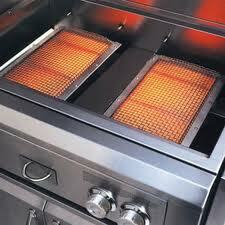 In fact, most infrared grills are designed to use this feature by collecting the drippings in a channel. They’re then vaporized back into the food as pure flavor, eliminating the fare-ups in ordinary grills that must be conquered to avoid burning the food. These channels just wipe or clean with a regular grill brush. This is because of the high heat. Finally, food actually tastes better on an infrared grill, according to many. This is due to the high temperature and direct heating. The infrared burners are wide and cook uniformly with even heat distribution. It locks in all the seasoning and natural flavors in your food. The quickness of the neat locks in moisture, too. Meat, seafood, vegetables – everything is quickly seared and flavor-locked for the best taste. If you’re old enough to remember when microwaves first hit the stores, you may recall that it took a while before people accepted them as safe. They were hesitant for quite a few years with scares of microwave-caused cancers and other horrible illnesses. Infrared grills are suffering from a similar type of misinformation-caused hesitance today. There is a mistaken belief that the intense heat of an infrared grill would burn and dry out the food. But in reality the exact opposite is true. Food remains juicy and flavorful. Infrared grills are more expensive than other gas grills, making them useful to restaurants, but usually not to homeowners. However this is changing. There was a patent on the infrared burners that has recently expired bringing in a flood of new manufacturers. What used to cost a lofty $4000 and more can now be had at a tenth that price. Some models have complicated components and end up requiring more maintenance and care than regular gas grills. When buying, be sure to check on warranty and repair considerations. Some actually don’t like the high heat of the infrared grills. They find they tend to burn their food. Generally this is quickly adjusted to my most people, but might be a consideration depending on your personal preferences and style. With an infrared grill, you needn’t go to an expensive steak house to get that perfectly cooked piece of flavorful meat. You can have it quickly and easily with very little clean up time with your own home infrared barbeque.